The release date is indefinite, but the game is still a go, says Sega. At this point, it might be considered a mercy if Aliens: Colonial Marines didn't show up on the Wii U, but like it or not, the game is still a go. 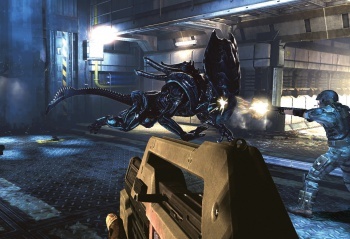 Fans expressed some concern (or possibly relief) when Kotaku intimated that the game might be the latest casualty of the Xenomorph menace, and when its Amazon listing disappeared. However, according to Sega, the game is still very much in the works. Regarding rumors of the title's cancellation, "It's not true," said a Sega UK representative. "We haven't announced the release date for it yet but that's it." The Wii U version of A:CM has never had a solid release date, so the fact that it still lacks one is perhaps not shocking. The game was initially supposed to come out during the Wii U's "launch window," which concludes in March. That timeline for the game is still not impossible, but seems less likely in light of the Amazon listing disappearing. Gearbox had previously indicated that A:CM might be able to do some exciting things with both the graphics and gameplay mechanics, given the Wii U's relatively powerful hardware and innovative controller. If the Wii U version plays more like the demo than the finalized game, a release would still be well worthwhile. Otherwise, it may be better to nuke the title from orbit. It's the only way to be sure.